We offer a wide variety of drum and percussion lessons. Most of our students learn on a drum kit. 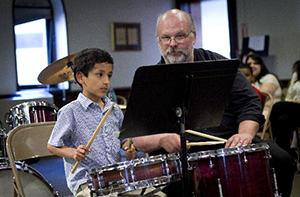 Drum and percussion students can begin lessons at age eight or older; however, after a consultation with one of our teachers, several have successfully begun as young as 6 years old. Drum lessons are taught on a drum kit in our studios, but students are able to get started practicing at home on practice pads before purchasing or renting a drum kit. Our drums lessons stress proper technique so that students become good drummers quickly. Recordings are often used for students to play along with in lessons and in some cases at recitals. Our instructors are experienced at teaching a very wide range of musical styles. We also have percussion students who choose to focus on things like snare drum for school bands, hand percussion, or marimba and vibraphone.